Ring Hostel was established in 2001 and is owned and run by the Colella family. The hostel is named after the very famous zone in which it is located: “Cierco a Forio” or just “Cierco”, which encircles the town centre. Cierco is napolitan dialect for cerchio, meaning circle or ring. All one needs to say is “Cierco” and no matter where you are on the island, the Islanders will know exactly where you mean. This very historic centre of Forio is the main residential zone to the town, the downtown of Forio, if you will, because it is in walking distance from all main amenities: markets, bars and boats. Before there were very few people with cars and a trip to Ischia port would be a once-a-month fiasco, for this reason, you’ll notice the streets in the cierco are extremely narrow and very old town Italian. Most people still make use of vespas and bicycles, although the art of Italian driving through the towns narrow streets should not be missed on a trip to our family’s restaurant in our beaten up old van. Over the centuries, the Ring hostel building itself could tell manya tale. 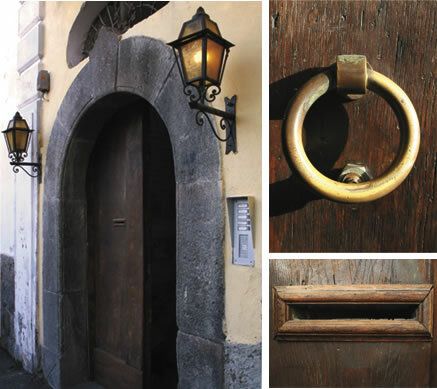 The large wooden antique doors at the entrance date back to 1828 (as is engraved) however this old house was once a 16th century monastery used by Saint Francis Monks (Frati Francescani). In the early 1900s, during the war, it became an after hours night club, and was the place to be. The property was then inherited by the Colella brothers’ late grandfather who then passed it on to their parents. In the late 1900s, the hostel was home to the family and the boys grew up in some of the very rooms which now serve as the hostel dormitories. Mamma and Papa still reside in the hostel, just like many of the original residents of Cierco, home will always be home. And this is how we want you to feel when you stay with us. Whatever faces the Ring Hostel has had in its ever changing past, it was always a type of sanctuary: for religious purposes; in times of war; and for family, a place to call home. And now the Colella’s open their arms to you, offering our travellers a convenient and affordable place to stay so that you can splurge on the best the island has to offer.